Poking around Windsor Terrace the other day, we spied this cabin-like building that sprouted between an aluminum siding-clad single-family house, and an aluminum siding-clad apartment house. 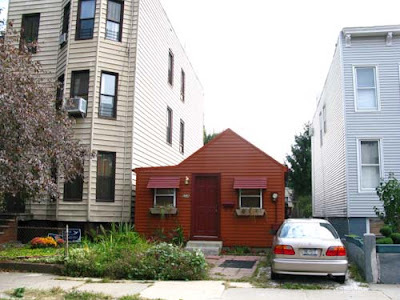 Much has been written about the growing tiny house movement in America, but while New Yorkers are famous for making due in small spaces, we don't often see them as freestanding homes. This one is 666-square-feet, on a 2,430-square-foot lot, and may we say it is adorable? City dwellers have been living in small apartments and quarters for ages, but its rare that you see so small a single family dwelling so close to a major metropolitan area like Manhattan, NYC- as its usually all multi-unit apartment buildings and condos that dominate the landscape. Its great to see the occasional ultra tiny house/home still holding out in an area where land is at such a premium.